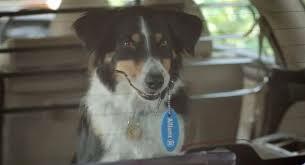 Being an animal lover, I love the Allianz tv commercials where a gorgeous dog called Sawyer steals the limelight and calls these ads his own. Sawyer returns in the second installment of Allianz’s “Ahhh moments” campaign and was first seen over summer in the TV campaign based on bad luck moments. A man standing in a suburban street puts Sawyer in the back of his car, then watches as his neighbour backs into a rubbish skip. When the owner turns back around Sawyer has the car keys in his mouth and has locked the vehicle. The owner says “ahhh”. Cute and smart! Sawyer came from humble beginnings, originally a rescue dog from the Hawkesbury Animal Shelter, where Julie (Sawyer’s owner, friend and trainer) saw an excited puppy who knew she had come for him! As well as being a superstar dog, Sawyer still helps out at the shelter by using his confidence and friendliness has to help other dogs with aggression problems. Julie says that sometimes dogs brought up on their own who don’t get socialisation from their own litter can end up fearful and aggressive. Dogs who are aggressive aren’t usually adopted out and with some shelters, end up being put down. So effectively, Sawyer ends up saving their lives! Sawyer is one truly amazing dog. Julie is a strong advocate for shelter adoption and we can see why! This is a sponsored post but opinions are my own, as per our Disclosure Policy. Previous Post The easiest way ever to teach kids how to tie their laces!